Carbisdale is an area situated in Sutherland, in the north west Highlands. The battle of Carbisdale took place in 1650. The Marquis of Montrose was defeated at Carbisdale by the Covenanting Army. He escaped from the battlefield and tried to reach safety in Orkney, however he was taken prisoner at Ardvreck Castle and taken to Edinburgh for execution. Carbisdale Castle is situated on the Kyle of Sutherland looking over the railway bridge and road. 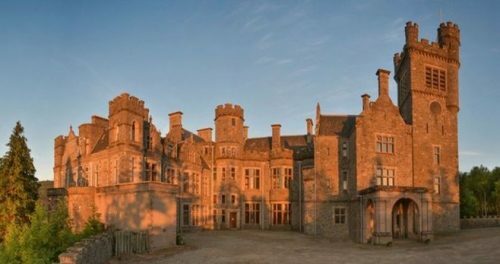 It was built in Scots Baronial style, with some Tudor influences, between 1906 and 1917. It was built by the Duchess Blair, who was originally the mistress and later the second wife of the 3rd Duke of Sutherland. When the Duke died at Carbisdale Castle there was a dispute over the terms of his will, resulting in the Duchess spending time in Holloway Prison because she destroyed some of the papers. The Duke left her his fortune and estate for life but the will was eventually disputed by his son and heir, who was the son of his first wife. Eventually the Duchess gave up her claim on receipt of a large sum of money , which she then used to build Carbisdale. She took some furnishings and pictures with her to Carbisdale and died in 1912 before the house was finished. Within the castle can still be seen the magnificent wooden staircase and marble statues along with other furnishings and pictures from Dunrobin Castle. Carbisdale Castle was built in a style to rival Dunrobin and is very imposing with towers and battlements. Unusual female figures can be seen on the rainheads and on the castle itself. The clock tower does not face Dunrobin because the Duchess did not to give the new Duke ‘the time of day’. During the second World War, King Haakon the 7th of Norway lived there, whilst it was owned by the Salvesens, a whaling family. It was later gifted to the Scottish Youth Hostels Association, making it possibly the most elaborate youth hostel in Scotland. 2014 saw it put up for sale and although potential plans exist to convert it into a luxury hotel, it’s future hangs in the balance. 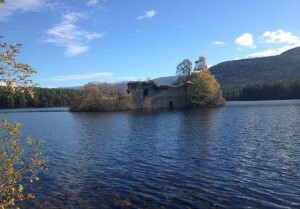 Whilst in the area why not visit a castle in the Scottish Highlands. The Black Isle has many great places to visit, one of my favourites is the Clootie Well. A clootie well is a place of pilgrimage in Celtic areas. They are wells or springs and usually have a large tree growing beside them with strips of cloth tied to them as part of the healing process. In Scotland and Ireland when using a clootie well the pieces of cloth are usually dipped in the water of the holy well and then tied to the branch while a prayer of supplication is said to the well’s spirit. Now a days this is usually a saint but in pre-Christian times it would have been a goddess. Mostly people are looking to be healed although some just wish to honour the spirit of the well. Variations of the practice exist including, washing the affected part of the body with the wet rag then tying the rag to a branch, as the rag disintegrates over time the ailment also fades away. At other locations the ceremony includes circling the well a set number of times and making an offering of a coin or stone. Other offerings such as religious medals, icons and crosses may also be hanging from the branches. Generally if the well is thought to heal ailments, the clootie is thought to represent the ailment and the offerings can be less than pleasant. However if the clootie is viewed as an offering to a saint it will be more attractive and even colourful. 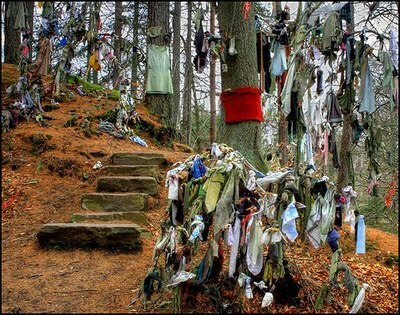 This clootie well near Munlochy is an ancient spring dedicated to the Saint Curidan where rags still hang on the surrounding trees and bushes. It was thought the well had the power to cure sick children who were left there overnight. Various items such as wool and human hair were also used as charms against sorcery or as tokens of fulfilment of a vow. The Clootie Well can be visited if you are on a Highland Tour from Inverness or an Invergordon Shore Excursion. 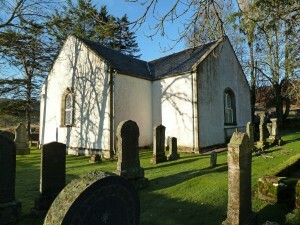 Croick Church is situated to the west of Bonar Bridge. The church is one of Telford’s parliamentary churches and was built in a well populated area which was cleared in 1845 when some 92 people were evicted to make way for sheep. The church was built in T-Plan with a small belfry and latticed windows. It still has it’s original fittings including pews, communion table, pulpit and readers desk. In 1840 a number of people from the area emigrated on a ship called the Hector to Pictou in Canada. The ship was chartered by the local minister and by the time the new minister arrived the village was devastated. James Gillander, the factor of Major Charles Robertson of Kindeace, evicted the people without giving them any alternative. More than 80 people took refuge in the churchyard where they camped in shelters of tarpaulin and blankets. Their plight was reported in The Times and further evidence is scratched on the church window, see picture below. It reads ‘Glencalvie people was in the churchyard here May 24th 1845, Glencalvie is a wilderness below sheep’. As the people themselves only spoke Gaelic it is thought the words are likely to have been scratched later, possibly by John Ross, shepherd in Croick, whose name appears several times. The Beauly Priory ruins are situated to the east end of the main village square. It was founded in the years following 1230 by monks of the Valliscaulian order from the Burgundy area in France. The monks also set up home else where in Scotland, Ardchattan, close to Oban and Pluscarden near the town of Elgin. The monks had been invited to the area by Sir John Bisset, here they remained for 300 years, until the Protestant Reformation of 1560. Upon arriving in Beauly the monks referred to the area as, Prioratus de Bello Loco, which is Latin for ‘Priory of the Lovely Spot’. This would suggest the popular belief that Mary Queen of Scots comment “Beau Lieu” or ‘beautiful place’ during a visit in 1564 was not the first reference to beautiful place or Beauly. Only the church now survives, in the shape of a Latin cross. A seven bay nave to the west and a three bay choir to the east, at the junction flanking transepts exist to the north and south. Parts of the church were rebuilt in 1540s by Abbot Robert Reid. It served as both a place of worship and burial. With some funerary monuments still to be found, dating back to 1479. This area being clan MacKenzie land, one dedicated to Prior Alexander MacKenzie, the other to Kenneth MacKenzie of Kintail can be seen. Other Mackenzie tombs are to be found in the north transept but this is usually locked. 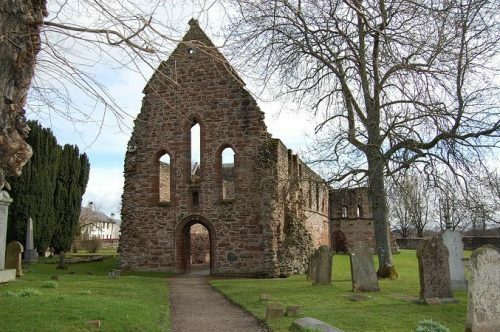 Set in a very special, secluded location in the pretty town of Beauly, the Beauly Priory is a fantastic place to visit and can be part of a Scottish Highland Tour or an Invergordon Shore Excursion. The Cairngorm mountain range can be extremely spectacular but also very cold! On 11th February 1895 the coldest ever temperature in the UK was recorded at Braemar in the Cairngorm mountain range, minus 27.2 degrees Celsius or minus 16.96 Fahrenheit. The Cairngorms, a name used to refer to the whole mountain range, named after an individual mountain by the name Cairn Gorm. This is slightly misleading as the original name was Am Monadh Ruadh which stands for the red hills, as opposed to the grey hills to the west the range. On a clear night looking from Aviemore the granite screes of the Lairig Ghru and Braeriach do infact glow red. The Cairngorm National Park is the largest in the UK and has something for everyone. Some of the best scenery you will find anywhere, an abundance of wildlife, full range of outdoor sports and distilleries to warm you after a day on the hills. Scottish Highland winters in the Cairngorms boast spectacular skiing, this can be enjoyed at one of the three ski resorts. 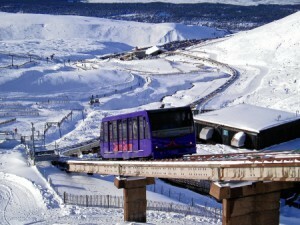 The closest to Inverness is the Cairngorm Ski Centre and you can often be skiing late into May. This is a great place to visit even if your not a skier, enjoy a trip on the fenicular railway up to the Ptarmigan restaurant. In summer time, one of my favourite areas is Loch an Eilean, a spectacular loch which you can walk around, with old castle ruins in the middle. The Cairngorm National Park and mountain range is a 40 minute drive away from Inverness, with something for everyone! Join me on tour for a great day exploring this fantastic area! 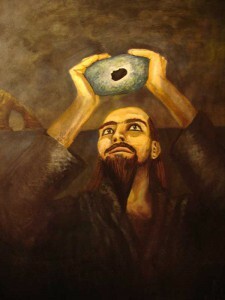 The Brahan Seer known as Kenneth MacKenzie or in Gaelic as Coinneach Odhar was a prophet from the 17th century. He is thought to have come from Uig on land owned by the Seaforths, however he is better known for his connections to Brahan Castle near Dingwall and the ‘Bonnie’ Black Isle, a peninsula near Inverness. Legend has it his mother had ‘the sight’ and one night when ghosts roamed free she came across the ghost of a Danish princess. To allow the princess to pass back into the grave his mother demanded a form of payment. This was to gift Kenneth ‘second sight’. Story has it that later that day kenneth found a small stone (Adder stone) with a hole in it and looked through this to see his visions. Many of his prophecies came true and were so impressive that they are still quoted today! It was a simple prediction that led to his death. Whilst working for the Seaforth’s he predicted the absent Earl of Seaforth was having affairs with several women in Paris. Whilst highly unlikely it brought embarrassment to Lady Seaforth which resulted in her ordering his death. It is alleged at Chanonry Point he was burnt in a spiked tar barrel! He predicted that when there were five bridges over the River Ness in Inverness that there would be worldwide chaos. In August 1939 there were five bridges over the Ness and on September 1 the same year, Hitler invaded Poland. He said that when there were nine bridges over the Ness that there would be fire, flood and calamity. The ninth bridge was built in 1987 and in 1988 the Piper Alpha disaster happened. According to Alasdair Alpin MacGregor’s The Land of the Mountain and the Flood, the Brahan Seer predicted that the bridge over the Kyle of Sutherland at Bonar Bridge would be “swept away under a flock of sheep”. On January 29, 1892 the Bridge was swept away by a flood. Eyewitnesses “likened the foam-current to a densely packed flock of sheep”. To this day there is fear his predictions will come true. A Celtic stone, the Eagle Stone, stands in Strathpeffer, Ross-shire. The Seer said that if the stone fell down three times, then Loch Ussie would flood the valley below so that ships could sail to Strathpeffer. The stone has fallen down twice: it is now set in concrete. 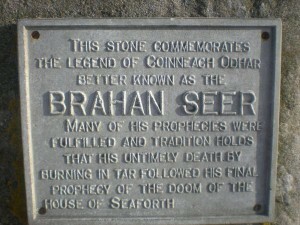 Various tours I provide visit the Brahan Seer stone, which is located at one of the best places in the UK to spot dolphins. Tour the Bonnie Black Isle with me and visit fantastic locations such as this! 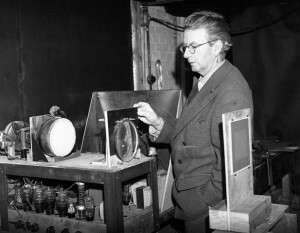 John Logie Baird was a Scottish engineer and one of the inventors of the mechanical television. He demonstrated the first working television system on 26th January 1926. He invented both the first colour television system publicly demonstrated and the first pure electronic colour television picture tube. He was born in the Scottish town of Helensburgh on August 1888, his father was a clergyman. Depsite suffering ill health most of his life he showed signs of ingenuity from an early age. Deemed unfit for the forces he worked as a superintendent engineer for the Clyde Valley Electrical Power Company. 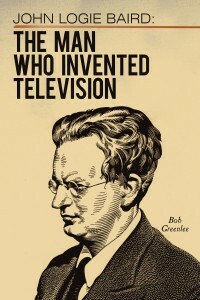 After World War One he moved to the south coast of England to apply himself to the invention of television. His first attempts were crude at best but by 1924 he had transmitted a flickering image a few feet in distance. 1926 saw the first demonstration of true television and in 1927 his television was demonstrated via telephone line over a distance of 438 miles between London and Glasgow. He than formed the Baird Television Development Company. 1928 saw the Baird company achieve a transmission over the Atlantic between London and New York. 1929 was the start of an experimental television service based upon the mechanical system, sound and vision were initially sent alternately but by 1930 they were simultaneously broadcast. The 1930’s saw other electronic systems developed and a BBC side by side trial between Baird’s mechanical system and a rival electronic system saw Baird’s system dropped in 1937. Today 30th November we celebrate Saint Andrew’s Day. He was one of Jesus Christ’s apostles, twelve followers chosen by Jesus. He became Scotland’s official patron saint in 1320 when the Declaration of Arbroath was signed. Although he was well respected and admired in Scotland from 1,000 AD. He died a martyr, being crucified in Greece on an X shaped cross in 60AD. This type of cross is also known as a saltire and this symbol makes up the Scottish flag. The link to Scotland comes from the Picts building a monastery in the town now called St Andrews after the relics of the saint were brought here in the 8th century. On the eve of a crucial battle between the Scots and English warriors, the Scots leader Oengus the second prayed to St Andrew. On the day of battle clouds are said to have formed a saltire in the sky. Oengus’s army of Scots and Picts were victorious and Saint Andrew was made patron saint of Scotland. It is said The Saltire Flag, a white cross on a blue background is based upon the divine intervention in the sky and has been Scotland’s flag since 1385. Up until the 16th century many made the pilgrimage to St Andrews, where remains of the saint were supposedly kept. The 30th of November, 60AD is the date Saint Andrew was crucified. It is a bank holiday in Scotland, and marked with a celebration of Scottish culture. This includes food, music, dancing and messages from both the Prime Minister and First Minister of Scotland. He is also the patron saint of Greece, Russia, Amalfi in Italy and Barbados where Saint Andrew’s Day is celebrated as the national day of Independence. 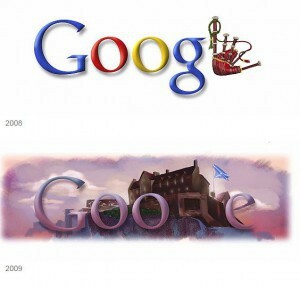 Google has recently marked Saint Andrew’s Day with Google Doodles here are a couple of my favourites. 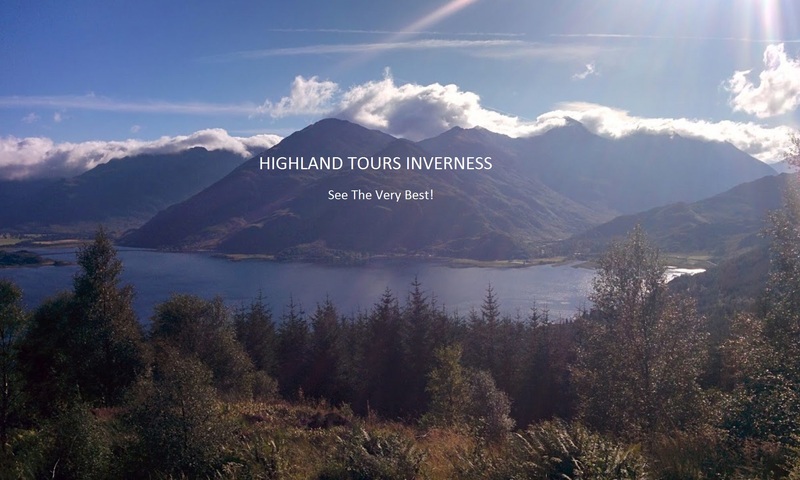 When visiting the Scottish Highlands for Saint Andrew’s Day celebrations or for any other reason, tour with Highland Tours Inverness and see the very best! Properly known as ‘Prehistorical Burial Cairns of Balnuaran of Clava’ the Clava Cairns are situated in a wonderful wood setting about a mile from Culloden Battlefield. 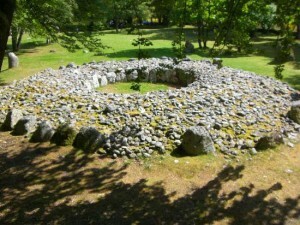 A Clava Cairn is type of bronze age circular chamber tomb cairn named after the group of three at Balnuaran of Clava. The cairns at Balnuaran are very well preserved and date back to 2000BC. The three cairns form a line running north east to south west, suggesting a focus on the mid winter sunset. Two types of cairns exist and both can be found here. The north east and south west cairns are known as passage cairns, the inner chamber linked to the outside world by a passage. You notice a drop in temperature when standing at the center! The middle cairn is a ring cairn with no passage linking it to the outside. The ring cairn has kerb stones around the outside, with paler stones facing north east and reddish stones facing south west. The two passage cairns have surrounding circles of standing stones, graded in height with the tallest facing south west. The passage ways of the of the two outer cairns point south west and on the shortest day of the year as the sun sets it shines along the passage way hitting the back of the chamber. This provides more evidence of a focus on the mid winter sunset or more precisely the winter solstice. The site was excavated in 1990’s but no evidence of bodies was found. It was not a surprise as the cairns usually only contained one body, indicating the person must have been important. The Clava Cairns are an excellent place to visit especially at sunset around the winter solstice. Highland Tours Inverness provides three tours visiting the Clava Cairns, but this is a great destination that can be included in any tour. Irn Bru Scotland’s other national drink, after Whisky of course! 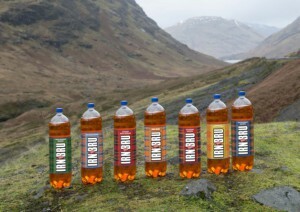 The Irn Bru advertising campaign slogan is ‘Made in Scotland from Girders’. To mark the 30th anniversary of this slogan the Forth Rail Bridge was transformed with Irn Bru bottles appearing on it, quite spectacular! It is produced by A.G. Barr of Glasgow, originally produced in 1901 it was called Iron Brew. This had to be changed in 1946 on the basis it was not actually brewed. So the spelling was amended giving the name Irn Bru. It’s a carbonated soft drink known for it’s bright orange colour and has long been the most popular soft drink in Scotland. People find it hard describing the flavour, ranging from bubble gum or fruit to jam. Apparently if you taste it whilst eating a piece of dry bread it tastes like a jam sandwich. To sample Irn Bru and other amazing parts of the Scottish Highlands get in touch with Highland Tours Inverness and enjoy the phenomenal experience for yourself! Ceud Mìle Fàilte to the Highlands of Scotland!